Earlier known as Burj Dubai, located in Downtown Dubai, UAE, and standing tall at 829.84m is the tallest man-made structure in the world. Burj Khalifa is as a living wonder, a stunning piece of art, and incomparable feat of engineering. Burj Khalifa forms a part of the new flagship development called Downtown Dubai, located at the First Interchange along Sheikh Zayed Road, in proximity to the main business district in Dubai. Developed by the leading developer Emaar Properties, the tower's architecture and engineering were handled by Skidmore, Owings and Merrill of Chicago. Samsung C&T of South Korea, who also built Taipei 101 and Petronas Twin Towers, was the primary contractor of this project. The Belgian group Besix and UAE's Arabtec, were the major sub-contractors. Construction of the project began on 21st September 2004. The project, worth US$1.5bn, was re-named Burj Khalifa, to honour the crucial support extended by the UAE President Khalifa bin Zayed Al Nahyan. Excavation work on Burj Khalifa began in January 2004, when the building completed several important milestones on its way to being the tallest man-made structure in the world. Within just 1325 days since the start of excavation work in January 2004, Burj Khalifa became the tallest free-standing structure in the world. More than 45,000 m3 of concrete, weighing more than 110,000 tonnes have been used for constructing the concrete and steel foundation, featuring 192 piles buried more than 50m deep. The construction of Burj Khalifa has taken more than 22million man-hours, 380 skilled engineers and on-site technicians, and has used more than 330,000 m3 of concrete, 39,000 tonnes of steel rebar. Burj Khalifa construction was done using special mixes of concrete, so as to enable it to withstand extreme pressures of the massive building weight. The consistency of the concrete used in the project was essential. In order to withstand the Persian Gulf temperatures that could even touch 50Â°C, the concrete was not poured during the day. Instead, it was done during the night when the air is cooler and humidity is higher, as the cooler concrete mixture prevents quick and easy cracking. 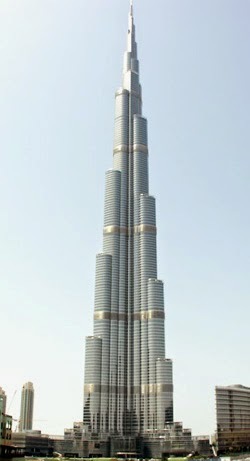 Burj Khalifa has accomplished a series of world records and construction milestones. In July 2007, on completing Level 141, it was named the tallest building in the world, while in September 2007, on completing 150 storeys, it was named world's tallest free-standing structure. Thereafter, in April 2008, on completing Level 160, it was named world's tallest man-made structure, and in January 2009, Burj Khalifa tops out with completion of spire. The external cladding was done in September 2009 and an official launch ceremony was held in January 2010. Burj Khalifa also has several other world records to its credit, such as that for highest installation of an aluminium and glass faÃ§ade, highest number of stories in the world, highest occupied floor in the world, highest outdoor observation deck in the world, elevator with longest travel distance in the world, and world's tallest service elevator. Burj Khalifa also houses world's highest outdoor observation deck, world's highest Mosque, world's highest nightclub, world's highest restaurant, and world's second highest swimming pool. Burj Khalifa has numerous awards to its credit, the latest being the 'Best Tall Building Middle East & Africa' award by the Council on Tall Buildings and Urban Habitat in June 2010. In September 2010, Burj Khalifa was awarded the 'Best project of the year' at the Middle East Architect Awards 2010. Burj Khalifa was honoured as the first recipient of "Global Icon" Award by CTBUH (Council on Tall Buildings and Urban Habitat) on 25th October 2010. The award recognizes special super-tall skyscrapers that make profound impact on the genre of tall buildings in the global market. The Residences at Burj Khalifa, one of the most-prestigious addresses, with more than 900 residences including studios, single, double, triple and four bedroom suites, are designed for the connoisseur. The homes located from levels 19 to 108 of Burk Khalifa with a rich array of amenities, offer residents an unmatched lifestyle experience. State-of-the-art fitness facilities, indoor/outdoor swimming pools, Jacuzzis, recreation room for gatherings and events, are all available on exclusive Sky Lobbies on levels 43, 76 and 123. Among the other amenities are, a resident's library, a cigar club, Burj Khalifa Gourmet Market, a gourmet convenience store, meeting place for residents, and valet parking for guests and visitors. The Residences at Burj Khalifa is nothing, but, urban life at its best. It offers all amenities of a metropolitan centre, but, with comforts and security of an exclusive community. The club is a major health and recreation by Burj Khalifa, open to residents of Burj Khalifa and the general public. The four-storey includes amenities including two luxurious indoor and outdoor pools, two gymnasiums, dedicated ladies-only gymnasium, and a contemporary spa facility, all spread across the 22,000 sq ft facility. The Corporate Suites, located on the highest levels of the tower, is the ultimate business destination for successful personalities at the corporate levels. The Corporate Suites comprise 37 storeys, with top three storeys being merged into a single office. The entrance lobby is at the Concourse of the tower, featuring Burj Khalifa reception team. Apart from valet parking for visitors and guests, there are express lifts that take visitors directly to the lounge lobby at Level 123, which is the meet-and-greet point. A complement to The Corporate Suites is the 12-storey annexure, The Offices, which will be directly accessible to Burj Khalifa and the Dubai Mall. The parking spaces for The Offices will be available at the mall and the tower, for convenience of tenants. Each suite is equipped with most advanced and digital telecommunications services. There are dedicated optical fiber links capable of offering up to 10 gigabits per second of broadband and multimedia delivery. Therefore, visitors can expect uninterrupted cellular service, even when riding elevators. The four floors above the offices will be leased to broadcast and telecom companies, it is said. Burj Khalifa is protected by a proprietary security system, and a team of well-trained security professionals to ensure safety, privacy, and peace of mind. There are in-house security supervisors and guards patrol the building interior and exterior round-the-clock. Due to security technology limits, sometimes, access is restricted to elevators, monitoring the critical building entry and exit points. Burj Khalifa features online home automation and account management access with e-Home and e-Services. With the help of these services, residents get to access automated environment for home-lighting, temperature, security, and access and more. They help in offering access to variety of services, viewing statement of accounts and for paying service fee, all within the convenience of secure, online access. The world's tallest building, Burj Khalifa, is located amidst Emaar's flagship community in Dubai, namely, the Downtown Dubai. Downtown Dubai, located in Sheikh Zayed Road, near the Toyota Building Flyover, offers an unparalleled lifestyle appeal to both visitors and residents, with various shopping options, ranging from the world's largest shopping and entertainment destination, namely The Dubai Mall, to the serene surrounding of Souk Al Bahar. On the whole, Downtown Dubai is a lifestyle destination located in a distinct mix of traditional and modern architecture. Visitors can use the Dubai Metro or taxi to reach Downtown Dubai. The November-March months are best for visit to the Downtown, when the weather is rather pleasant. Else, during the warm summer months, the Emaar Malls Group has introduced air-conditioned Trollery Buses to serve visitors. Other than the iconic Burj Khalifa, some of the major attractions in Downtown Dubai are The Dubai Mall, Souk Al Bahar, Gold Souk at Dubai Mall, Emaar Boulevard.